The Giants’ bullpen was responsible for a seemingly infinite number of meltdowns and blown leads over the second half of last year. (If you’re counting, 43 meltdowns per the official statistical definition.) They took a key step toward fixing that this winter by signing Mark Melancon to a four-year, $62 million contract. But their relief problems were always bigger than one reliever, and the team’s performance so far this season has shown it. All of the usual caveats applied to any baseball analysis done after a week of games are applicable here—it’s been a week! relievers work in especially small sample sizes! etc.! But given how pressing of an issue their bullpen was last year, it’s at the very least been frustrating for the team to see this year start off with the same problem. The Giants have lost four of their five games so far, with the pen wholly responsible for the losses both last night and on Opening Day and something of a contributing factor in another. 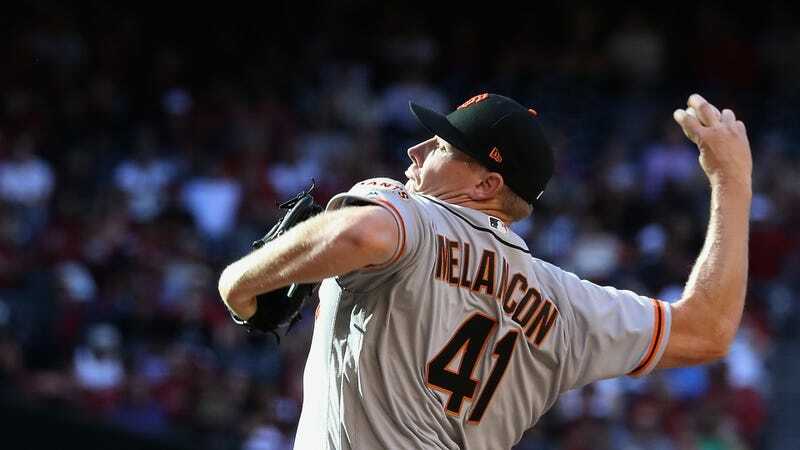 Melancon has made just one appearance so far—giving up two runs on four hits while struggling to record two outs—and that was in the team’s first game, six days ago at this point. Some of the culprits of last year’s most maddening blown saves are gone—Santiago Casilla, Javier Lopez, Josh Osich—while the only meaningful addition other than Melancon is Neil Ramirez, who spent last year in the Twins’ minor-league system and has so far given up two runs in two innings of work for the Giants. Is the season’s first week of performance indicative of exactly how the relief corps is going to look all year? In all likelihood, no! But is it a pretty sad look all the same for a team with the Giants’ track record here? Yep!